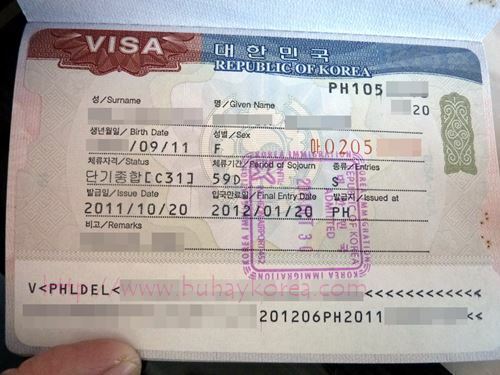 Please visit Korean visa for Filipinos for a more updated post. I have four friends who are supposed to apply for their tourist visa to Korea next month. It’s a good thing that they checked the new requirements for tourist visa to Korea. They decided to apply on Friday instead. The new tourist visa requirements will take effect on March 1, 2015. How about if you dont have work as of thia moment your apply for tourist visa? How would it be? Hi..pwede po ba mag buy ng ticket agad kung kumpleto naman kami ng requirements? helo po…gusto po namin ng hubby ko mgtuor ng Korea kahit 3days and 2 nights lng kaya lng plain housewife ako walang work…pero husband ko ngpatrabaho s Singapore pwede po b ako makakuha ng tourist visa kahit wla akong bank certificate o itr? Hi Primaly! Yes, pwede mong gamitin ang documents ng asawa mo as long as legally married kayo. Kailangan mo maglakip ng marriage contract ninyo (NSO) para patunayan ang relationship ninyo. Yung husband mo pwede na siya sa Singapore mag-apply ng visa niya. So yung bank certificate at certificate of employment kahit sa asawa mo manggaling. Bumisita dito last month yung pamangkin ko na nagwo-work sa Singapore, diretso siya from Singapore tapos yung wife niya sa PIlipinas naman nag-apply ng visa. Hi! OFW po ako and as far as I know, and OFWs po ay tax-exempted. Paano po yun kung nagre-require sila ng ITR? I’m planning to visit SK po sana sa annual vacation ko. Thanks in advance! Hi Elaine! Kuha ka ng certificate of tax exemption or non-filing of income tax return po from the BIR. Yes po. Need ng visa. Aside from the documents listed above, you could ask your sister to send you an invitation letter and a copy of her passport. If you have a Belgian passport, you could come to Korea visa-free and stay for up to 180 days or 6 months. If you don’t have a Belgian passport, aside from the documents above, make copies of your visa and residence ID. If you’re not working, you could show your husband’s documents plus your marriage certificate. Hi po gusto ko po sana mag tour s jeju island do i still need to apply visa?currently im in malaysia and may sponsor po s skin ng invitation letter,possible po ba n mkpsok aq ng jeju without visa? hi po mam park dti po is ininvite ako ng sister ko sa korea and my visa is for 1 year tpos po bgla po ngka emergency so 6 palang po visa ko umuwi npo ako and then ng invite po ng ibang kapatid namin ang sister ko magapply po sana ako tourist para mbisita po sila d pu ba ako mhihirapan makakuha ng visa? Hi! Kailangan lang subukan. Di mo malalaman hangang hindi sinusubukan. Hi po, employed po ako pero wala akong bank account. Ok lang po ba yun? Requirement po ang bank account, kahit payroll account po.